Finally, a gaming laptop portable enough that you might actually bring it somewhere. There’s an old saying: You can have performance or portability in a gaming laptop, but not both. The MSI GS63VR Stealth is the first laptop I’ve seen using Nvidia’s GeForce GTX 1060, and I’m suitably impressed. In fact, I’m blown away by the amount of performance that can be squeezed into a laptop that’s actually portable. How portable? On our postal scale, the laptop pushes just over four pounds sans power brick. Granted, it’s not as featherlight as an ultrabook, but the Stealth is right in the neighborhood of the svelte Dell XPS 15 and Apple MacBook Pro 15. The MSI GS63VR Stealth is a little bigger than a MacBook Pro 15 (2013-2016) and Dell’s latest XPS 15, but it packs a much bigger punch with its GeForce GTX 1060 GPU. Inside the Stealth, you get an Intel 6th-gen quad-core Core i7-6700HQ paired with 16GB of DDR4/2133 RAM. For storage, our $2,099 review sample (available for $1,999 on Amazon) came with a 512GB Samsung SM951 SSD and 1TB hard drive. Who makes the hard drive? Do you care? The 15.6-inch monitor is a wide-viewing-angle 4K panel with a light anti-glare coating. Before you start complaining that this system should have a quad-core Kaby Lake CPU, you should know 7th-gen quad-core Kaby Lake CPUs won’t grace computers until early next year, so this is the current state of the art. The real star of the show is, of course, that GeForce GTX 1060. If you’re not caught up on current events, Nvidia has dropped the “M” from its laptop GPUs because it feels its mobile parts are the equal of their desktop counterparts. For the most part that’s true, as you can see from this quick spec sheet I cobbled together: The mobile GPU has the same CUDA core count and memory bandwidth as its equivalent desktop chip. The main difference between desktop and laptop GPU is in the clock speed, where the notebook gives up a little bit of speed. Nvidia’s GeForce GTX 1060 for notebooks gives up a little clock speed but is otherwise identical to its desktop counterpart. 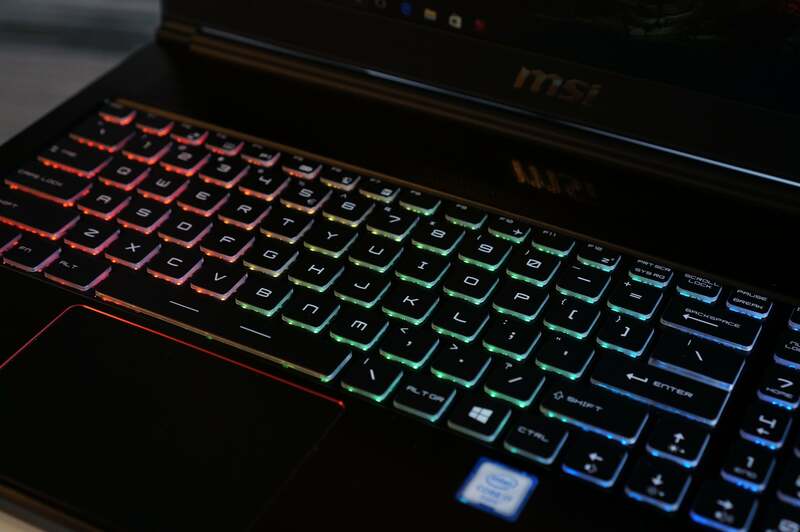 On the exterior, the laptop has the MSI “look and feel” but with plenty of gamer appeal. The backlit keyboard has three-zone lighting, and there’s a 10-key number pad, but it’s so small that anyone with big meat claws will find it challenging. The key action is okay, but not noteworthy. The same can be said of the piano-hinge trackpad, which feels metallic, but also works reasonably well. The keyboard features a three-zone backlight but it isn’t particularly bright. The shell itself is brushed magnesium-lithium. There’s a slight give when you squeeze the body but nothing that would appear to compromise the device. For ports, you get three USB Type A 5GBps, one USB Type A 480Mbps, a Thunderbolt 3.0 port, HDMI 2.0, and a Mini DisplayPort. You also get gigabit ethernet using a Killer NIC controller, an SD card reader, a Kensington lock, and two analog audio jacks. The Wi-Fi is also a KillerNIC part supporting 802.11ac. 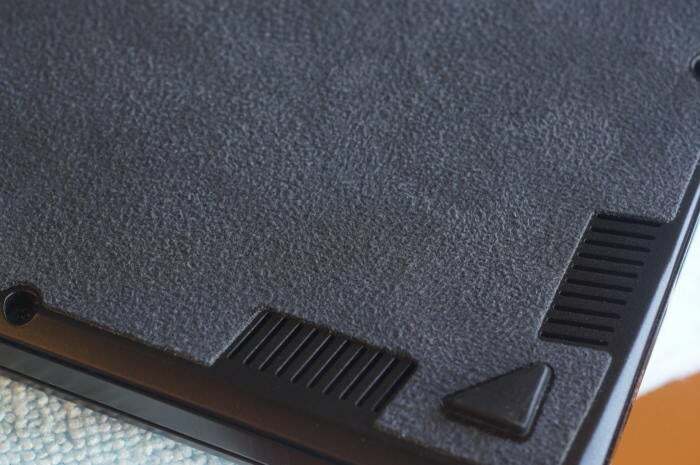 The entire bottom of the MSI GS63VR Stealth is covered with a suede-like material that actually makes it comfortable to use on your lap. Since this is the first laptop I’ve received with a GeForce GTX 1060, I was very interested to see if it hit the bar Nvidia set for the desktop chip: equivalence with the GeForce GTX 980. 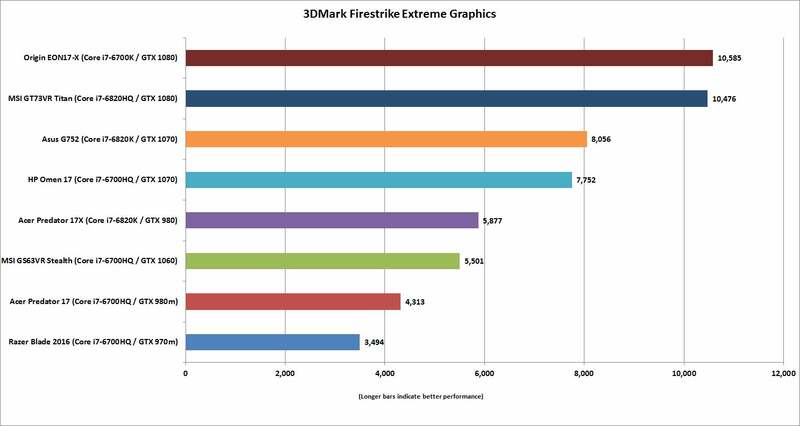 The first test is 3DMark Fire Storm Extreme. I’ve broken out the graphics score, a subscore of the overall performance, to assess the GPU. For comparison, I looked at the results of behemoth gaming laptops that weigh between 8 and 10 pounds. I also threw in an older Razer Blade laptop with a GeForce GTX 970M. The Stealth outpaces the Razer laptop as well as the Acer Predator 17's GeForce GTX 980M by a healthy margin. But it doesn't quite catch the GeForce GTX 980 chip in the Acer Predator 17X. Still, it’s damned close. 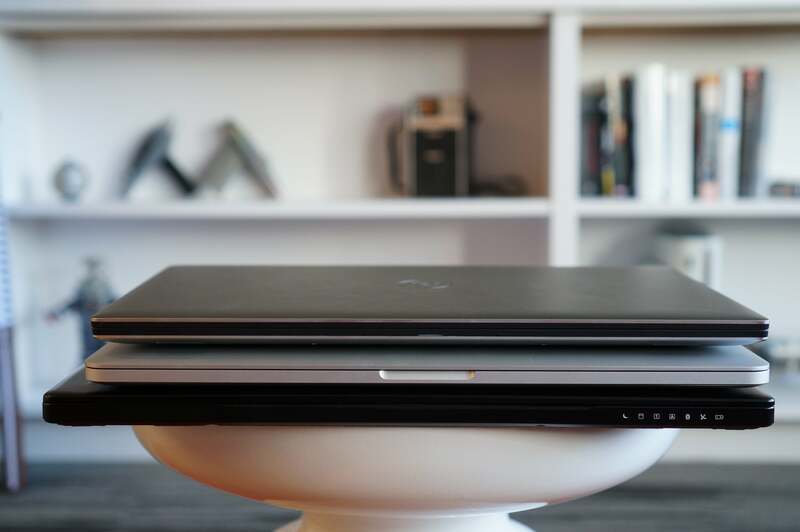 Considering its weight and size, the Stealth does very well against big burly laptops. Most people like to see the overall score too, so I’ve included the results here. Remember, the overall score factors in the CPU, so it’s not a surprise that we see the Acer Predator 17X with its Core i7-6820HK and better cooling push a little further ahead of the Stealth. And just to give you a sense of the full performance range, I’ve thrown in the overall scores I have from lower-powered GPUs as well. These scores include lower-end 15-inch laptops and show you the huge gulf between the bottom-end GPUs and the GTX 1060 in the MSI Stealth. Tomb Raider is old at this point, but still a worthy real-world test if you want to see how a 3-year-old game performs on a laptop. 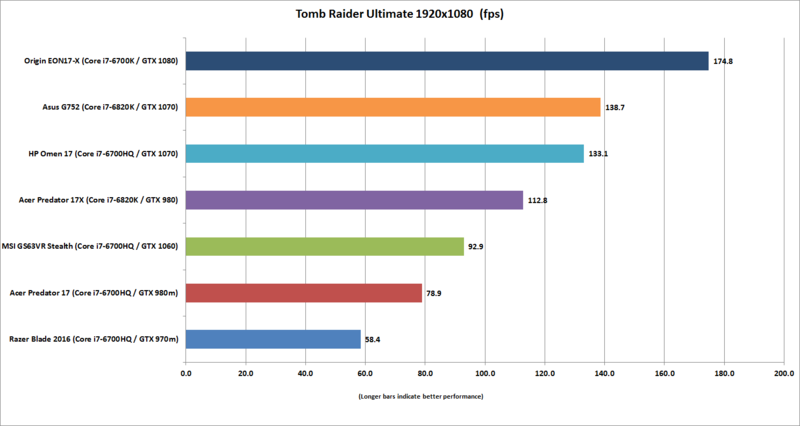 The results are mostly weighted toward the GPU, but the benchmark does tend to like faster CPUs, too. 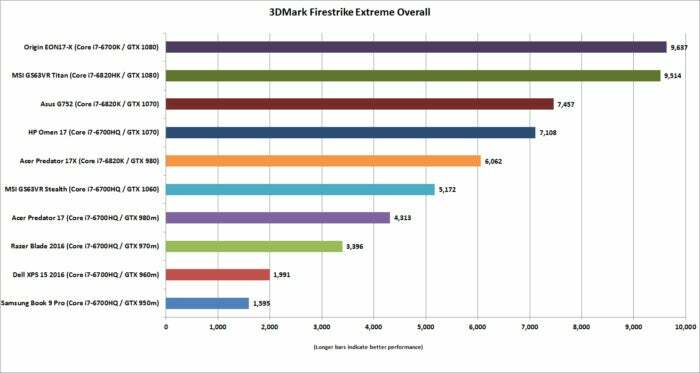 The results basically mirror that of 3DMark FireStorm Extreme’s overall scores, with the GTX 1060 a step behind the GTX 980 in the Acer Predator 17X. Our tests were run at 1920x1080, which is the most common gaming resolution right now. 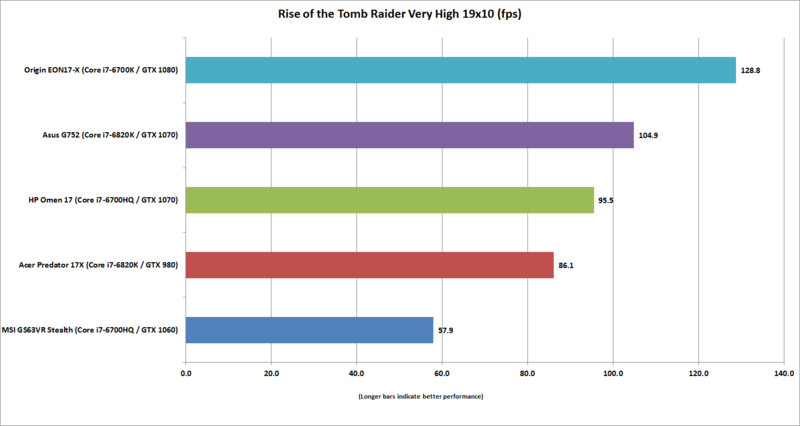 Tomb Raider is about three years old at this point, but scales well with graphics and CPU performance. 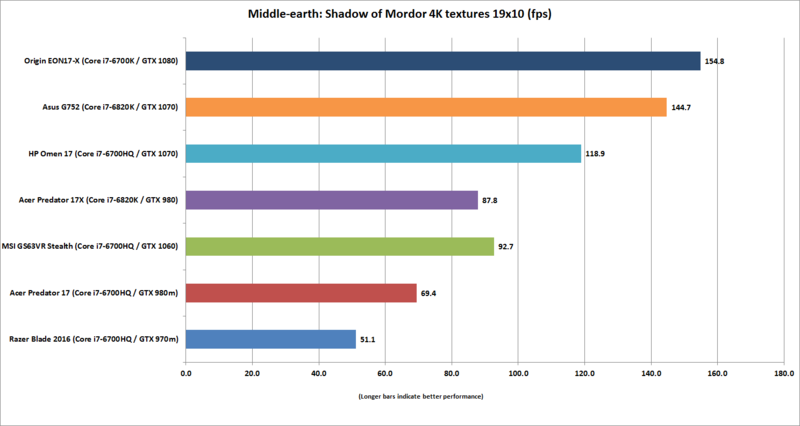 I also ran a newer game, Middle-earth: Shadows of Mordor, on the Ultra setting at 1920x1080, and found the Stealth to be exceptional. The Stealth’s GTX 1060 proves to be just as fast here as the larger and heavier Predator 17X’s once-mighty GTX 980. And no, this isn’t because the GTX 1060 has 6GB of memory versus the standard 4GB frame buffer of GTX 980 desktop cards. Like most big gaming laptops, the Predator 17X packs the 8GB version of the card. This is all Pascal at work here, and it’s a good showing for the Stealth and GeForce GTX 1060 card. You won’t be wanting for frame rates with the GeForce GTX 1060 in the MSI Stealth. Naturally, you're probably wondering about 4K performance, what with the Stealth's 4K panel. But as awesome as the GeForce GTX 1060 is, it can’t handle 4K gaming on the highest settings. 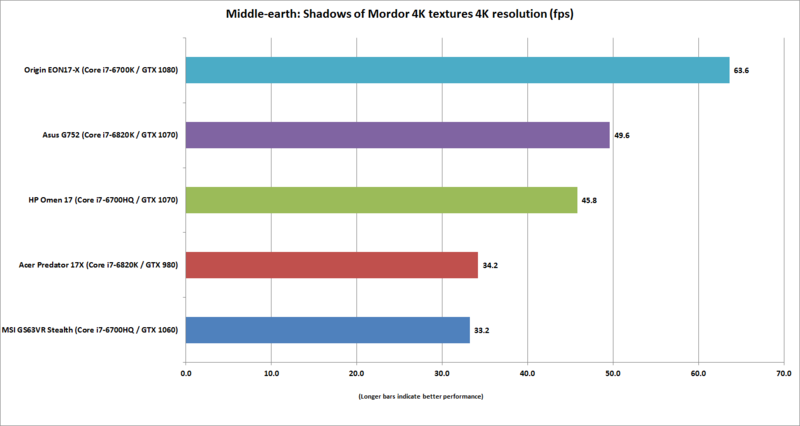 You can see this in the results for Shadows of Mordor at 4K resolution. I don’t have results for the Razer Blade at this resolution nor the Acer Predator 17, but I think it’s okay to excuse both the GeForce GTX 970M and GeForce GTX 980M from the room because gaming at 4K is only for real GPUs. Looking at the chart, you may think the GeForce GTX 1060 and GTX 960 can join the 970M and 980M for early recess too, since it’s clear neither are up to the task without turning down knobs. The good news for the Stealth is that the GTX 1060 runs just about dead even with the GTX 980. When you remember that the GTX 980 was the top dog in gaming laptops just a few months ago, that’s a hell of an accomplishment. I’d say that expecting 4K gaming from the GTX 1060 is too much. One last gaming test comes from the fairly new Rise of the Tomb Raider game. I ran it on the Very High setting, at 1920x1080. (I also have 4K results, but like Shadows of Mordor, it’s not pretty.) Here, the GTX 1060 lags much more significantly behind the GTX 980 in the Acer Predator 17X. Why? Looking back at the green comparison chart up top, I’d surmise that it's due to the GTX 980's massive CUDA core advantage. Even though Nvidia says the CUDA cores in the newer Pascal chips are 135 percent more efficient, it may not be enough to out-muscle sheer numbers. The good news is the Stealth and GTX 1060 are basically capable of running this game at high-quality settings at around 60fps. The GTX 980’s raw CUDA core advantage may give it a big step up over the GTX 1060. The vast majority of our tests focus on the thing that matters the most for gaming: the graphics card. However, since people actually do things outside of gaming on their computers, I pitted the Stealth against the thicker, beefier laptops in our Handbrake encoding test. This benchmark uses the free and popular Handbrake encoder to convert a 30GB 1080p MKV file into a smaller MP4 using the Android Tablet preset. 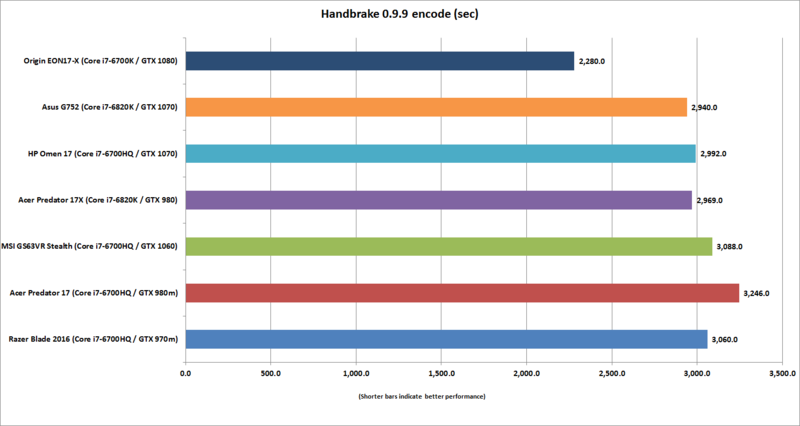 Handbrake hearts CPUs, and you see improvements as you add more cores and more megahertz. As the thin Stealth uses pretty much the same Skylake quad-core as just about every other gaming laptop we’ve seen all year, performance is, well, about the same. The fastest of the bunch is the Origin EON17-X with its overclocked desktop CPU, but for the most part, the Stealth can hang with the rest of its competition just fine. 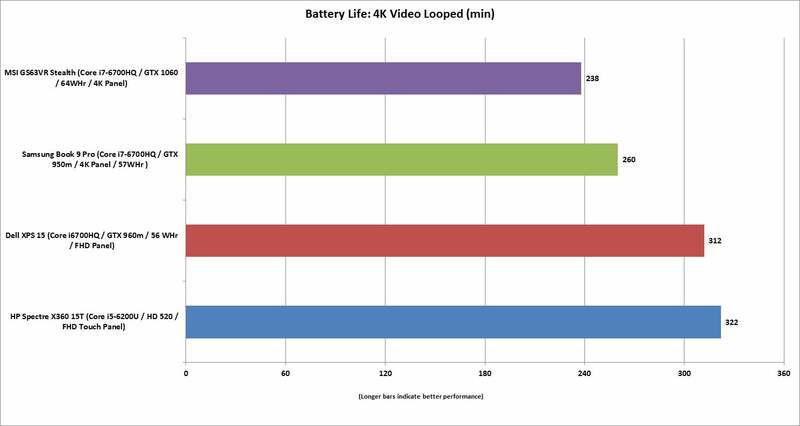 Typically we don’t care about battery life on burly gaming laptops. That’s because the moment you crank up a 130-watt GPU to play a game on a battery, you’ll be lucky to get an hour out of it. Really, the battery in gaming laptops is there so you can unplug it and move from the kitchen to another room where you plug it in again. With the Stealth though, we’re now in an interesting world. 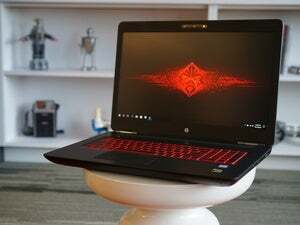 It’s a “true” gaming laptop that lets you run modern games on Ultra at 60fps, but at four pounds, it’s also a laptop you can use on the move. To see how the Stealth does in battery life, I used our standard video rundown test, where we play a 4K-resolution file using Windows 10’s Movies & TV player. The screen is set between 250 nits and 260 nits, which is a good brightness for a daytime office or home setting, and we plug in a set of earbuds and leave audio on. Rather than compare it to the big gaming laptops, which very few will regularly bring onto an airplane, I pitted the Stealth’s battery life against that of the Dell XPS 15 (which has a smaller battery), and a Samsung Book 9 Pro. Both are similar in size to the Stealth and also pack quad-cores and discrete graphics (albeit with far lower performance). For a reference, I also included HP’s Spectre X360 15T, quite a different beast with a dual-core and integrated graphics. The MSI GS63VR Stealth uses a lithium-polymer battery and features but two small speakers. 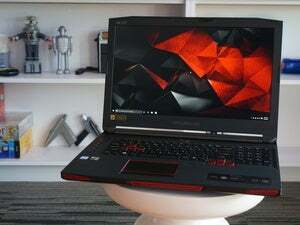 The Stealth's results revealed pretty mediocre battery life, even though the Stealth uses Nvidia’s Optimus, which shifts the workload over to the integrated graphics for lighter duties such as this test. For comparison, the Samsung Book 9 Pro also has a 4K-resolution screen (higher-resolution screens use more power) but its battery is more than 10 percent smaller than the MSI. For what it’s worth, this battery performance was also generated with the laptop on its “eco” mode. I saw about about half an hour less runtime when it was in “sport” mode and the keyboard backlight was on. Basically, expect around three or four hours of battery life in general use. You can get more, but you’ll have to crank down the brightness. The best option for those chasing better battery life might be to opt for the 1920x1080 version of the Stealth. The Stealth’s battery life isn’t great, but it’s not as bad you’d expect either. As much as the GTX 1060-equipped Stealth is a game changer, there’s plenty that’s far from perfect. First, the panel. Its colors just don’t pop and the screen isn’t terribly bright overall. Just to hit the minimum brightness test for our video rundown, I had to run the Stealth brightness at 100 percent. The 4K resolution panel also doesn’t support G-Sync (Nvidia’s adaptive refresh technology). This isn’t all MSI’s fault though, as G-Sync currently doesn’t work with Optimus—and if MSI hadn’t implemented Optimus, you’d likely get worse battery life, since the discrete GPU would run all the time. That said, trying to push gaming at 4K without G-Sync is pretty futile on a GTX 1060 (it isn’t even a great idea on the next-step-up GeForce GTX 1070). Since you don’t have the horsepower to play at 4K UHD resolution, should you bother with the 4K panel? Especially if the panel doesn’t zing like other 4K panels we’ve seen? Nope. Opt for the 1920x1080 instead, so you can run everything at or near Ultra settings. Another weakness is the Stealth's audio. It consists of two small bottom-firing drivers in the front of the laptop. There’s just no low- or midrange to them, and when they’re cranked up, they’ll occasionally rattle. Despite its drawbacks, I’m still blown away by what the MSI GS63VR Stealth delivers—a 4-pound laptop that can play the newest games with settings at or near Ultra. That’s just a tectonic shift of portable gaming capability we’ve just never seen before. 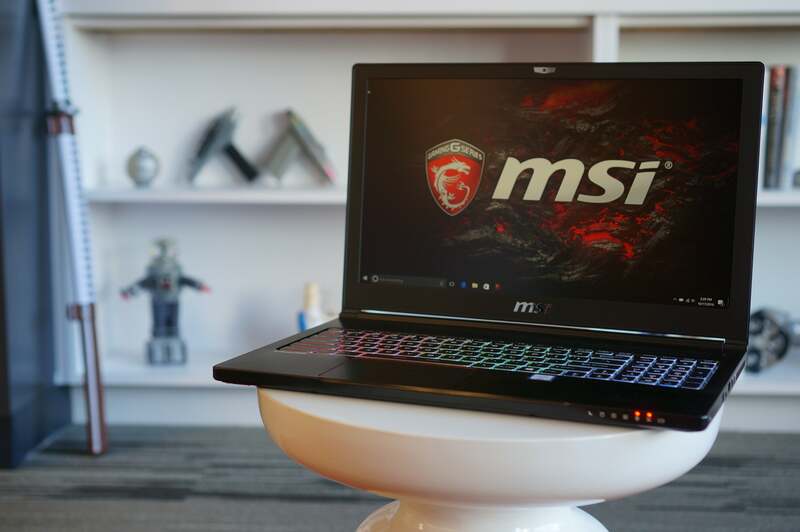 The MSI GS63VR Stealth's GTX 1060 GPU offers 50 percent more performance than you would previously find in a gaming notebook this portable. Mind-blowing performance in a thin and light package. Reasonably priced for what you're getting. 4K screen isn't very bright and lacks zing.